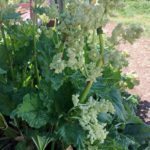 Should rhubarb stalks be red or green before harvesting? It depends on the variety. Some varieties should be red when harvested, while others should be harvested when green because the stalks never turn red. If you have a red variety, wait until the stalks are red to harvest.